Raphanus sativus L. includes an annual root vegetable crop, radish, and diverse wild species. R. sativus has a long history of domestication, but its phylogenetic position in the tribe Brassiceae is controversial. A comprehensive analysis of the R. sativus genome will provide fundamental information about the structure of its genome, evolutionary features of polyploidy, and significant insight for phylogenetic delimitation of this species. Diverse genomic resources, including a high-density genetic map, clone libraries, cytogenetic data, and transcriptome data, have been developed to sequence the genome. Recently, the R. sativus cv. ‘WK10039’ (2n = 18, 510.8 Mb) genome was sequenced and assembled into nine chromosome pseudomolecules spanning >98% of the gene space. 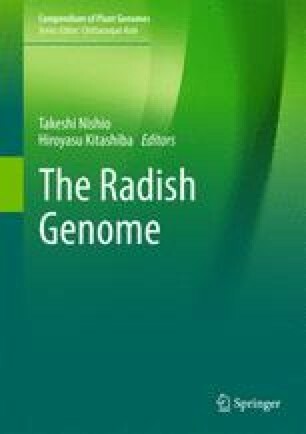 Comparative mapping of the tPCK-like ancestral genome based on conserved ortholog set markers and proteome comparison revealed that the R. sativus genome has intermediate characteristics between the Brassica A/C and B genomes with triplicated segments, suggesting an internal origin from the genus Brassica. The evolutionary characteristics shared between R. sativus and diploid Brassica species provide genomic evidence for species delimitation of R. sativus and reconstruction of the mesohexaploid ancestral genome.